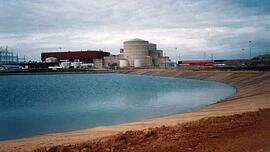 Sequoyah Nuclear Plant installed 200,000 square feet process wastewater impoundment using XR-5. Consultants Stone and Webster, along with TVA's Sequoyah Nuclear Plant in Soddy-Daisy, TN, chose XR-5 for this process wastewater impoundment. This large (200,000 square feet) impoundment serves as a holding pond for various waste and washwater from the non-radioactive portions of the plant. The highly efficient XR-5 geomembrane also provides an emergency spill basin for the entire facility.